After a few months in the app store and lots of great feedback, we’re excited to announce that Verbally 2.0 is available, including an in-app purchase to unlock Verbally Premium. Designed for people who use Verbally as an everyday communication aid, Verbally Premium includes several useful improvements. Improved Voices. The new voices from Acapela are louder, clearer, and more natural-sounding than the voices in the free version. 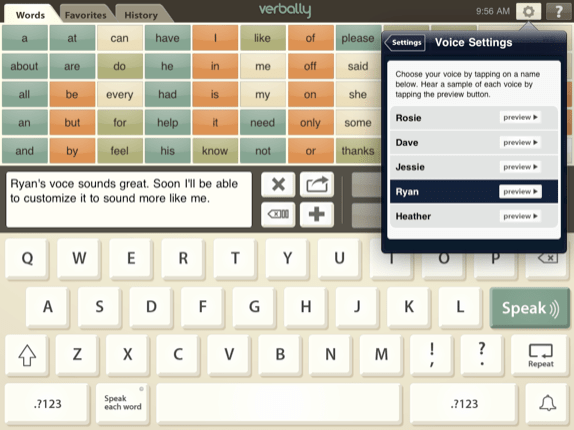 Soon you’ll also be able to customize each voice to sound how you want to sound. Favorites. 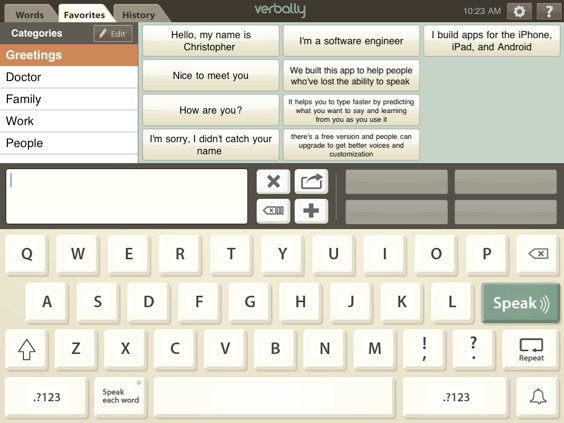 Verbally includes a small set of buttons that allow you to enter a complete phrase or sentence in one tap. In Verbally Premium, you can customize these buttons with your own text, add an unlimited number of your own phrases, and group them into your own categories. Better Predictions. One of Verbally’s unique features is how it helps you type what you want to say quickly, to better keep up with the pace of a spoken conversation. Using Verbally’s word predictions reduces the number of taps required by up to 50%. 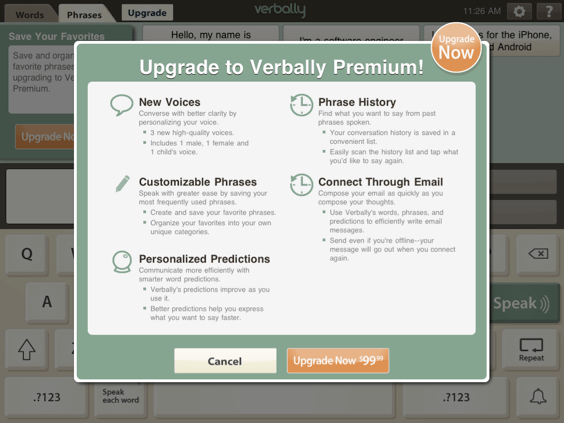 Verbally Premium learns how you speak as you use it, and customizes the predictions accordingly, making it even more efficient. History. 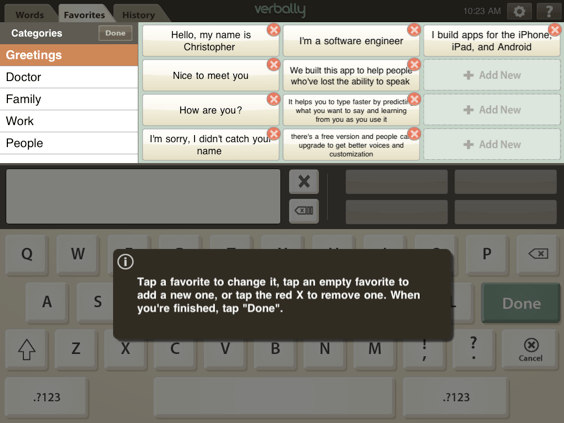 With Verbally Premium, you have access to everything you’ve ever spoken in the app. 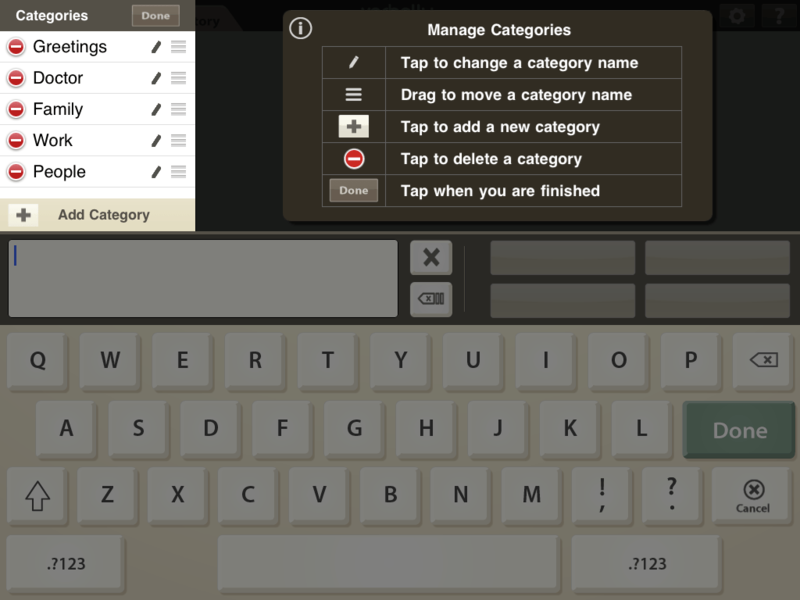 This makes it much faster to access that diatribe you painstakingly typed in, so you can repeat it at will. We’re listening to customer feedback and working with Speech-Language Pathologists around the world to continue to make Verbally the most usable, useful, and affordable tool available for people who’ve lost the ability to speak. If you have ideas for how Verbally could improve, or would like to share a story about how Verbally has impacted your life, send us a note.